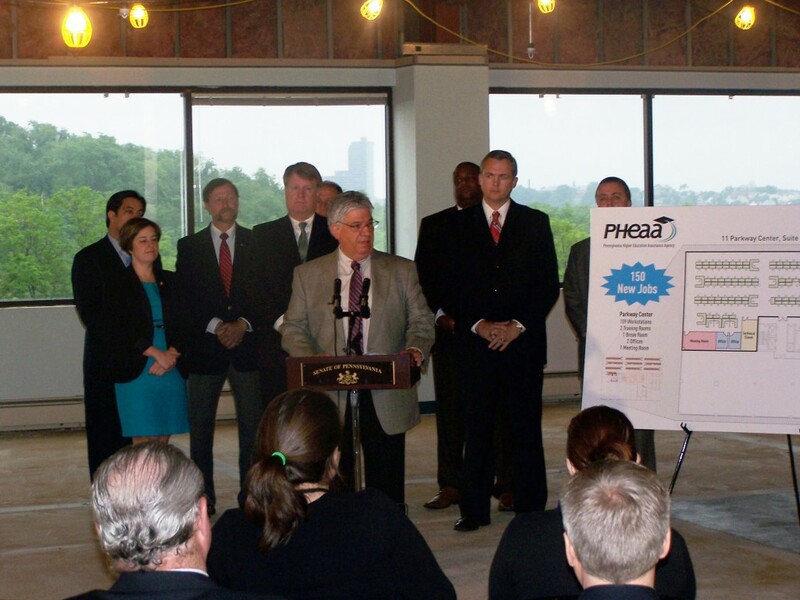 Pittsburgh, PA (June 7, 2013) – Senator Wayne Fontana, Vice Chairman of the Pennsylvania Higher Education Assistance Agency’s (PHEAA) Board of Directors, today announced a new job creation initiative in Allegheny County that will generate 150 employment opportunities for local residents. [frame align=”right”] [/frame]Building on 50 years of financial aid experience, PHEAA services student loans commercially as American Education Services and for the U.S. Department of Education as FedLoan Servicing. Senate Democratic Leader Jay Costa, Allegheny County Executive Rich Fitzgerald and other state-elected dignitaries joined Senator Fontana in making this announcement. PHEAA’s combined student loan servicing operations help nearly 11 million borrowers manage their student loan debt in Pennsylvania and throughout the nation. As a self-funded state agency, PHEAA uses its business earnings to support its public service mission and to pay its operating costs, including the operation of this new facility, administration of the Pennsylvania State Grant, and other state-funded student aid programs. Additionally, PHEAA contributed $80 million of its earnings to supplement the State Grant Program in 2012-13, which provided for larger grant awards to thousands of additional students with financial need. PHEAA currently employs nearly 3,000 individuals in Dauphin, Cumberland, Centre, and Delaware Counties. PHEAA will hold its first Allegheny County recruitment event on June 25th at the new facility’s location, 11 Parkway Center, Pittsburgh, PA, from 11 a.m. to 2 p.m. Operations with full-trained staff is expected to begin in the fall of 2013. Potential candidates are encouraged to visit PHEAA.org/jobs to learn more about available positions and to follow PHEAA’s jobs Facebook page at Facebook.com/PHEAA.jobs for the latest employment and job fair updates.